Throwback Thurs! Meeting Alicia Vikander And Eddie Redmayne! The Danish Girl Q And A! Autographs! Photos! And More! 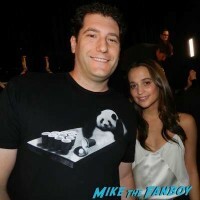 With the new Tomb Raider film on the horizon, I thought a good Throwback Thurs would be the lovely and wonderful Ms. Alicia Vikander! Heart her! This was a q and a for The Danish Girl and Alicia was so so nice. Check out it out below! Photo Flops! Chris Meets The Danish Girl Star Alicia Vikander But His First Photo Is A Flop! Doh! Special Guest February 11, 2016 Chris S., Photo Flops! Billy Beer Falls In Love With The Danish Girl After Meeting Alicia Vikander! Autographs! And More! The Danish Girl UK Premiere! James Meets Eddie Redmayne! Alicia Vikander! Tom Hooper! Autographs! And More! Manic Monday! Pinky Says, “I know You Are, but What Am I?” After Meeting Pee Wee Herman Himself, Paul Reubens! Super Short Sunday! Scotty Takes A Trip Innerspace After Meeting Dennis Quaid! Autographs! And More! Box Office Breakdown! The Curse of La Llorona Scares Its Way To Number One! Hellboy Crashes! Breakthrough Was A Little Icy! And More!